I’m always a bit reticent when I see non-golfing brands making leaps across industry channels. Maybe it’s a narrow-minded viewpoint on my part, but I always feel as though they have more to prove – that they actually have what it takes to be bona-fide specialists, rather than simply casting the net out as far and wide as they can to milk their mighty brand for every dime that it’s worth. Then again, Nikon don’t produce rubbish, and they’ve now established quite a name for themselves when it comes to rangefinders as a result of their revered product line. So, is the Coolshot 20 worth its salt? That’s what we’re here for. 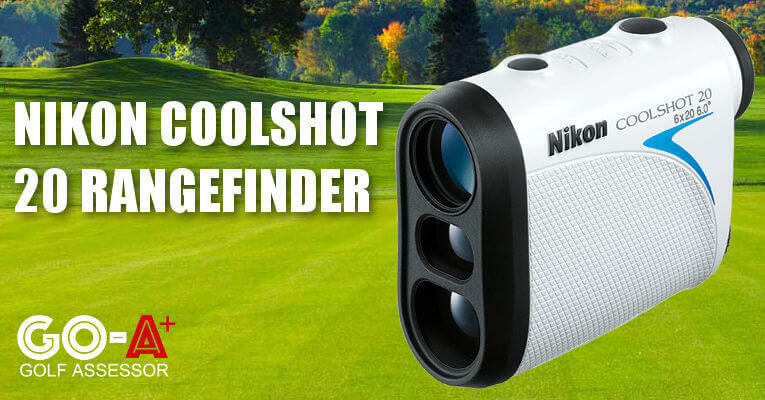 We reviewed the Nikon Coolshot 20 Rangefinder as part of our Best Golf Rangefinder Review. You can see how it faired against it’s competitors in the side-side comparison table below. If you already own the Nikon Coolshot 20 Rangefinder please feel free to leave your own review in the comments at the end of this article. 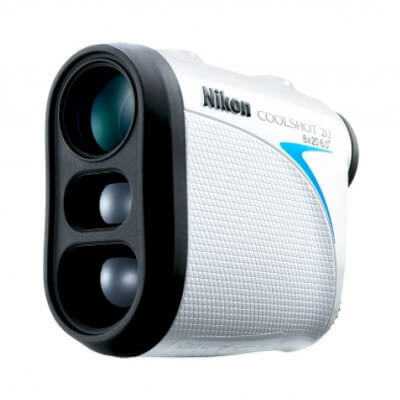 Looking to buy the Nikon Coolshot 20? 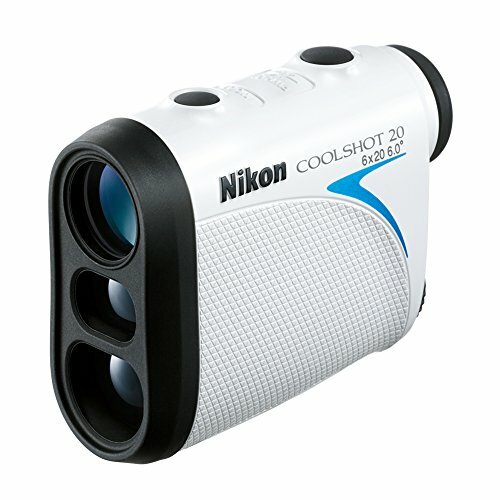 Use the Quicklinks below to navigate our Nikon Coolshot 20 Rangefinder Review. “How did they get everything in there?” These were my first thoughts when I assessed the Nikon Coolshot 20, and I’m sure yours will be the same. It’s breathtakingly… tiny! And super light too. Son in terms of weight and size the Coolshot 20 get’s the biggest tick in the box. But what about its other features? Well, in our test run it performed pretty well in terms of it’s core functionality. It locks in accurate distances quickly and easily; has an adequate range, and is very well priced. Some may think that it is too lightweight, which could lead to instability, but that’s really down to personal preference. We think that there’s plenty of grip, and that the Coolshot 20 will appeal to players of all sizes, shapes and abilities. Very lightweight, exceptionally small and also looks pretty cool too. Fits into your pocket easily and is a breeze to use. All for less than $200. The immediate sense you get when you pick it up is that you feel as though you’re dealing with a precious piece of porcelain, which could break even just by gripping it too hard. But this is a pretty sturdy little device. In fact, if you drop it, the crafty salesmen I was chatting with reckon that the stylish white cover should just about save the day. Oh, and said cover is rainproof too (although I’m always skeptical of the difference between this and “waterproof”). In terms of features, well, not much to report here. It’s able to offer you measurements in yards and meters, and does so with a 6X magnification. It’s accurate to within a yard over short distances, and two yards once you go beyond 150. Truth be told, if you’re after fancy, top-of-the-range features and gimmicks, you’re probably best to look elsewhere. But failing that, you’ll be satisfied that this rangefinder has all the features that really matter. Even lighter than the Callaway 300 – There aren’t enough superlatives in the dictionary to describe how this rangefinder fares in this department. You may have a different take on this, and we fully accept that some people will actually think that holding this feather-like device steady will be an unnecessary challenge. But the breeze was blowing when we trialed it, and we didn’t have any problems. And I’m a big, clumsy, cumbersome man! It is incredibly small and very lightweight. Not to mention the price is less than $200. There’s no hidden pitfalls here – this one is very straightforward, even if you’re a technophobe! Aim at your target and hit the rear button to switch it on. It will turn itself off after about 10 seconds, but that’s just to preserve the battery. The button at the front allows you to flick between yards and metres, thus appeasing both those of a metric or imperial disposition. The rangefinder encompasses Nikon’s First Target Priority Technology, which makes picking out the flag from the background a piece of cake. The distances appear in 1 yard/metre increments, while it’s also user-friendly to those who wear spectacles, given that you can easily adjust the focus. Probably the only downside overall is that it can take a while to pick up flagsticks if they are more than about 180 yards away. Yikes, there must be some angry competitors out there seeing this rangefinder priced below $200! Yes, it’s a simplistic piece of machinery compared to some of the leading lights on the shelf at the moment. But it’s no worse than ‘mid-range’ in terms of quality, and yet it costs a snip. From where we’re standing, that can only mean one thing… Great. Value. For. Money. Me thinks you might be just a little bit tempted, all things considered.